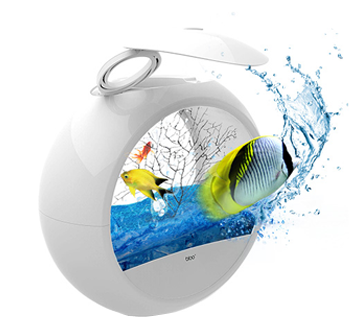 【2 Charge Modes】Works with Qi-enabled devices. (1)FAST CHARGE Mode ONLY available for the Galaxy S8 / S8 Plus, Note 8,Note 5, S6 Edge+, S7 and S7 Edge. (2)Standard Charge Model(Output 5W Max) for other standard QI enabled device like iPhone XS, iPhone XS Max, iPhone XR, iPhone X, iPhone 8/8 Plus, Samsung S6,S6 Edge. 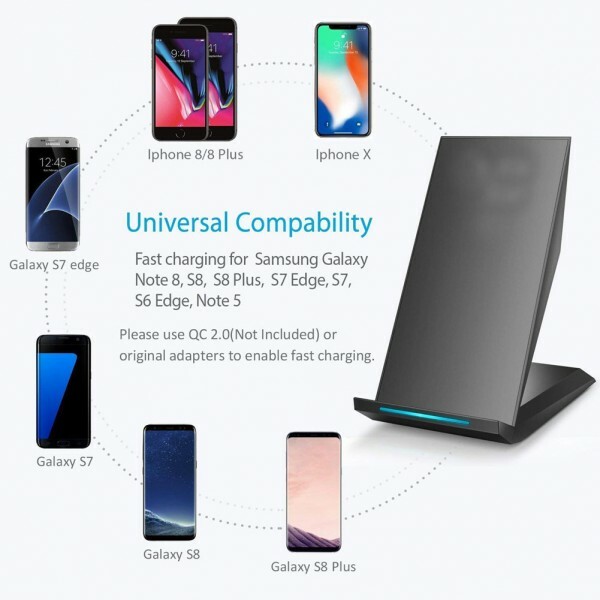 【FAST Wireless Charger】Up to 1.4x faster than standard wireless charging pad, super high efficiency and save your time.Charges your phone up decently and not having to plug in and out each time! Also it doubkes as an upright stand for your phone whilst charging. 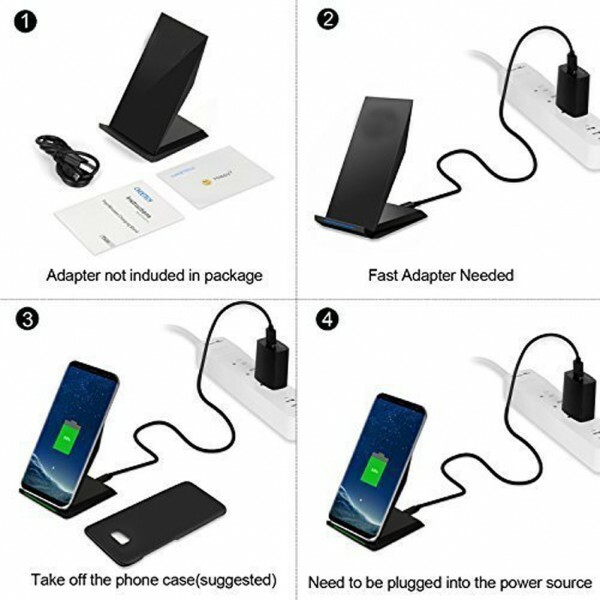 【Twin Coil Charger】As long asyour phone sits on the cradle properly it will charge, it is NOT as irritating as some of the expensive chargers out there that you have to align it properly to get it to start charging. 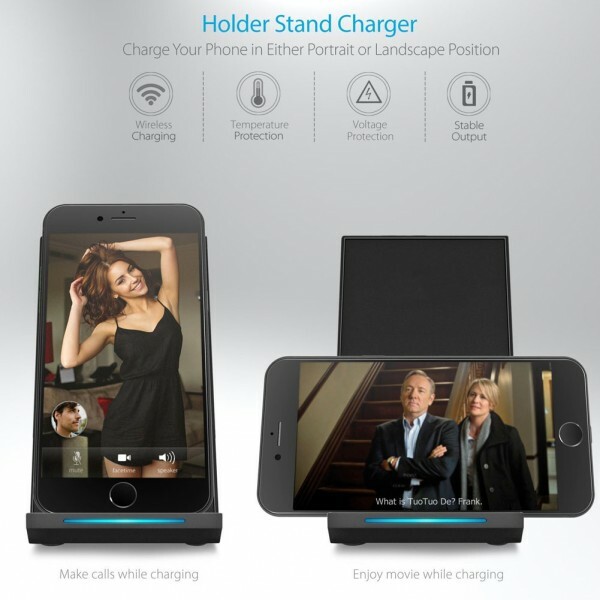 Much wider charging area allows you to place your phone with a free position. 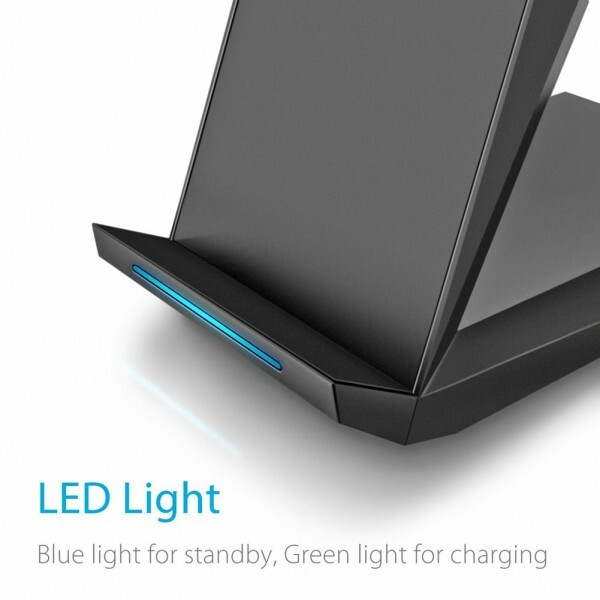 【Sleep-Friendly LED Indicator】2 soft LED lights indicate charging status but dim enough at night, it's barely noticeable which ensures No beep, No annoying lights even next to bed while charging. If you want to charge your phone overnight you will find when it reaches full it will switch off . 【Safe Charging】It's normal for the pad and phone get warm slightly during charging ,but the Temperature Control ensures safe charging and imporve the life of your phone! Over current/voltage protection, short-circuit protection and foreign body detection, never overcharges your battery or wastes energy. The PHONE CASES is suggested to be REMOVED while charging. 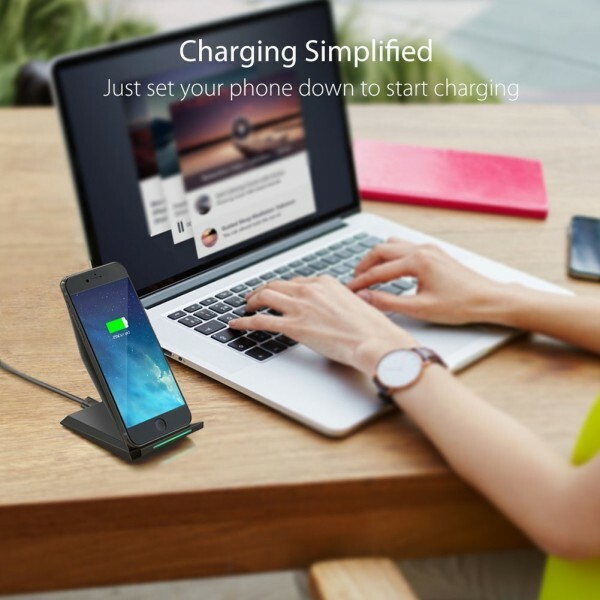 QI Association Member As we have joined QI Association, ensures faster and safer wireless charging life! Can i charge with the case on? It does but is a bit inconsistent. PHONE CASES is suggested to be REMOVED while charging for better experience. Important Note ★Due to S8 products' self-protection, sometimes you can only charge your phone to 70%--80%. Take it off for a while, and put it back on again, then it'll charge the remaining amount. ★Regular speed-It will charge all Qi-enabled devices at regular speed(3-4 Hours). ★This charger is not compatible with original adapter that came from S7 or S7 Edge. 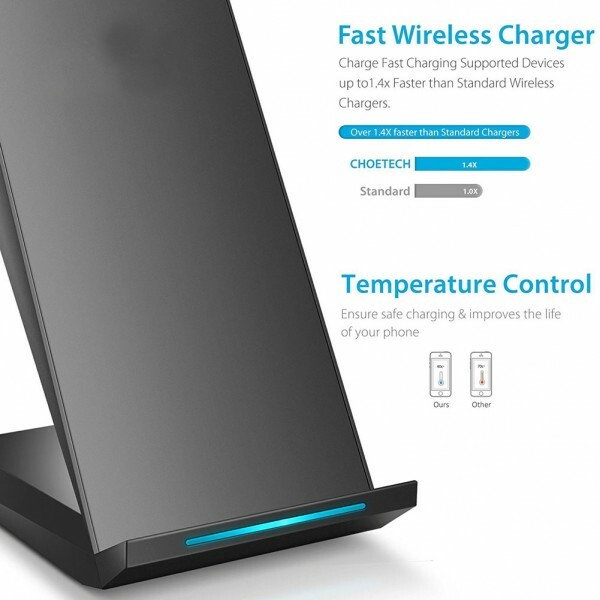 ★QC 2.0 Adaptive Fast Charger is required for the fast charging. 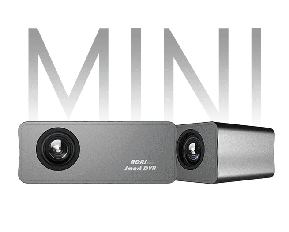 Choetech is fast becoming a great accessories company. This wireless charger dock is simple and works a treat. phones fit perfectly on the stand next to me on my bed side table. fairly fast charging considering it is wireless. definitely convenient. Brilliant piece of work! I use this wireless charger at home next to the computer. It is angled perfectly, allowing me to use face/iris unlock when sitting in my chair (works well seeing as my fingerprint sensor is at the back of the phone). A blue/green indicator to inform you if it is on standby or if it is charging the phone!